In addition to defence and military missions, natural disaster preparing and responding, damage repairing and search and rescue operations have been recognized by No.5 Military Region’s Party Committee and High Command as one of the key and permanent duties, which reveal the good qualities of “Uncle Ho’s soldiers”. These activities also help improve the close relations between the Region’s armed forces and local people, Party Committees and authorities, contributing to the concrete “posture of people’s hearts and minds” in the area. The area that the No.5 Military Region is in charge of is composed by three main territories. Mountainous and highland territories are usually affected by landslides, flash floods and cyclones, while littoral ones, seas and islands are often struck by typhoons and heavy rains, which can cause floods. In general, this area is quite complicated in terms of meteorology, climate and territory, creating many difficulties to the Region’s disaster preparing and responding, damage repairing and search and rescue operations. In 2017, 299 natural disasters, 87 accidents, 60 fires and 8 wildfires took place in this area, among which, the most noticeable cases included landslides in North Tra My, South Tra My, Phuoc Son district (Quang Nam province); Son Tay, Tra Bong districts (Quang Ngai province); fires at a THACO BUS workshop and a paint warehouse of Truong Hai Group; 10 ship drownings in Quy Nhon Port during Damrey typhoon, etc, causing many life losses and serious damages to properties of the Government, local people and forces of No.5 Military Region1. Acknowledging serious damages that natural disasters can inflict, armed forces of the Military Region attach great importance to disaster preparation and responding, damage repairing and search and rescue operations. In 2017 only, 104,170 soldiers and militiamen, 1,131 vehicles of all kinds were utilized to evacuate 21,324 households; repair 6,785 houses, 273 schools, commune offices and 278 kilometers of road; join search and rescue operations and be presented at inundated places for traffic control. 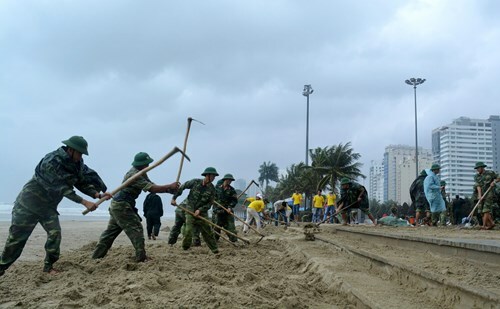 In doing the jobs, besides requiring efforts from its armed forces, leaders of the Military Region called for financial helps from local budgets to acquire and repair the vehicles and equipment which were worth 9 billion VND, to build 28 houses for those who severely affected by Damrey typhoon and provide 2 million VND in compensation for each death. Towards this end, right at the beginning of 2017, Party Standing Committee and High Command of No.5 Military Region recognized in their military and defence resolutions and orders that disaster preparing and responding, damage repairing and search and rescue operations were important missions which required enhanced leadership. The Committee and High Command also released instructions to subordinate bodies and units on how to draft related plans and introduce them to their officers and soldiers. The Military Region determined these were their key and urgent missions in peacetime. At the same time, the Region’s High Command and its affiliates have finalized and amended their detailed plans, emphasizing the “4 on-sites” guidelines, the collective power of all local forces, in which armed forces play the key role. They also regularly check their preparation, anticipate possible situations, proactively prepare their forces, vehicles and equipment needed in disaster responding for best results. Moreover, in coordination with local Party’s Committees and authorities, they persuaded people to join the preparations. The High Command directed lower-level units to establish disaster response steering committees and examine the entire dyke system and all the places with high risk of suffering flash floods, landslides, fires and wildfires, etc. to design feasible responding plans. Following the High Command’s directions, military commands of provinces and cities in its in-charge area cooperated with local border guard commands to give good advice to local Party’s Committees and authorities in examining and amending all plans of infrastructure building and economy – society developing so that disaster response functions can be integrated. As commanded by the Military Region’s leaders, it is important to ensure effective and stable communication system, well-prepared vehicles, equipment, roads, landing fields which will be needed in disaster preparing and responding, damage repairing and search and rescue operations. Besides, all subordinate units are improving soldiers’ awareness of disaster response, and training them to operate related equipment and vehicles in the most effective way2 as planned. When disasters took place, command posts were established at highly effected places. These posts collaborated with local authorities to direct available military and civilian forces in helping people to repair damages. Military commands in related provinces and cities, in collaboration with border guard commands, managed all local ships, provided them with needed information and instructed them to move to the nearest shelters. These forces also made necessary responses, evacuated local people, and persuaded them to make needed preparation. After each disaster, the Region’s forces participated in recovery efforts, such as restoring people’s production and normal life. These contributions of No.5 Military Region’s armed forces were highly appreciated by local Party’s committees, authorities and people. In the future, natural disasters will take place in complicated and unpredictable ways. To deal with them successfully and following the guidelines: “It is unavoidable to cohabit with disasters. Responding to them is like fighting against the enemies. Four on-sites are guidelines. Improving abilities is focus”, the High Command of No.5 Military Region requires its subordinate units to understand and follow these instructions. First, to enhance the leadership of Party’s Committees at all levels and effectively implement the rules: Leadership from the Party; Directions from authorities; Consultancies from bodies, committees and services; Key roles for armed forces; Collective power from the entire political system; Improvement of responding abilities. Party’s Committees and unit commanders should recognize disaster preparing and responding, damage repairing and search and rescue operations are key missions of their units that need their accurate directions. Moreover, together with local bodies, services and organizations, those Party’s Committees and units need to improve their ability in giving good consultancies as well as cooperation mechanisms for better disaster preparing and responding and damage repairing operations. Towards these ends, at the beginning of each year, leaderships at all levels should, in their resolutions, decide particular solutions. During the year, they need to thoroughly understand disaster situations, and make close and accurate analyses as basis for precise directions for human resource development and vehicle and equipment preparation - as required by the “4 on-sites” guidelines - so that the collective power of all society can be utilized in making preparation for and responding to disasters as well as repairing damages. Second, to further the education of all bodies, services and people for their better awareness of disaster preparing and responding, damage repairing and search and rescue operations. This disaster-related responsibility should be determined as one of important missions that can partly decide the whole year’s task performance of each unit. Military units should also collaborate with media agencies to provide necessary information in order to help people understand that disaster preparing and responding, damage repairing and search and rescue are responsibilities of everyone in the entire society. Besides, related bodies and agencies should closely cooperate with local communities in implementing these missions, taking proactive preparation as the main solutions and avoiding underestimating disaster situation. Third, to be self-dependent and self-reliant in disaster preparing and responding and use all needed resources for this mission. Being self-dependent and self-reliant, people in the coastal areas of Thang Binh (Quang Nam province) have dug dugouts; and those living in the depressions of Tuy Phuoc district (Binh Dinh province) invented “xong tre” (bamboo rafts) to live on when floods come. With the same spirits, armed forces of No.5 Military Region have been proactively studied territories in their area; examined and amended their responding and rescuing plans; regularly conducted training programs and exercises to improve their forces’ abilities; and prepared their vehicles so that they can be sent out even in hazardous weather and to rough territories for timely responses. The Region have also acquired new specialized vehicles and equipment; established professional and semi-professional forces, in which civil defence forces serve as the backbone; organized task forces, of which the main elements are firefighters and police and military special forces. Moreover, the Region has paid attention to ensuring on-site usable vehicles and equipment as well as an effective on-site commanding mechanism. The Region’s High Command also work together with disaster steering committees and management boards of local dams and irrigation systems to properly free the water-flows in the way that is safe for people at lower courses. Fourth, to be updated on disaster situation; to provide accurate forecasts and necessary information for people in the area; to be proactive and creative in making preparation and responses. The unpredictability of natural disasters is a big challenge for people to prevent their serious impacts. This fact requires accurate and timely forecasts, which can help ships at sea move to shelters in time. Besides, weather and hydrology conditions need to be watched closely. When a disaster happens, leaderships at all levels should opportunely give directions for their units and relevant forces to make proper responses. Forefront commanding posts will be established at most effected places to, in coordination with local Party’s Committees and authorities, help people deal with the disaster. Littoral military units should closely observe ships at sea; opportunely inform them about weather situations; and direct them to the nearest shelters as well as be ready to be launched for giving assistance. Fifth, to assure good logistical and technical supplies for all the forces involved in disaster responding and damage repairing. Local military and civilian logistical forces should be well coordinated, among which, provinces’ and cities’ military ones play the main role. Floods and typhoons usually isolate several places, posing a lot of difficulties to response forces in providing assistance and rescue. Therefore, leadership should make use of strong points of each logistic unit in their areas. As the main force in disaster responding and damage repairing operations, the No.5 Military Region’ logistic units always collaborate with other forces in providing needed supplies, creating a resilient logistical and technical supplying network - as required by “5 combinations” guidelines3 - to utilize collective efforts for this important mission. To meet practical requirements, armed forces of No.5 Military Region recognize disaster preparing and responding, damage repairing and search and rescue operations as their key missions in peacetime. The success of them will contribute to damage reduction and people’s trust in “Uncle Ho’s soldiers”. 1 – Live losses: 235 died and missing people, 221 injured others. Property damages: 3,035 buildings collapsed; 78,982 roofs was blown away; 68,032 houses was flooded; 381 electric poles was cracked; 223,896 livestock and poultry died; 112,296 hectares of crop and flower were ruined; 158 houses, 167 vehicles of all kinds were damaged; 66 hectares of forest and 17 fishing boats were burned; 1,179 other fishing boats were drowned or seriously damaged. 2 – In 2017, the Region organized search and rescue courses for 88 personnel who hold more than one position concurrently; motorboat and propeller repairing and operating courses for 188 technical personnel. 17 officers of the Region attended the collapsed building response course provided by the MOD. 3 – “5 combinations”: 1. Combination with local civilian logistical and technical forces; 2. Combination of logistical and technical forces with response ones; 3. Combination with central logistical and technical forces of other services who are available in the affected area; 5. Combination of local economic and social development and local military logistical and technical force building.